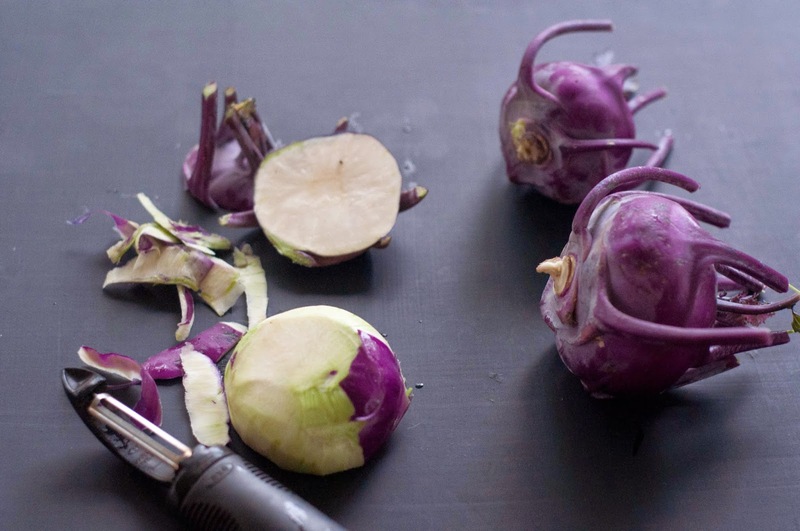 Kohlrabi is a super cool vegetable and one that is getting a lot of attention this spring. Its alien-like appearance draws you in for a closer look. It's name has German roots: "Kohl" meaning cabbage and "Rabi" meaning turnip due to it's bulby bottom half. A very cute grey haired lady told me she grew kohlrabi in her victory garden. Many members of the 65 + age range are familiar with kohlrabi and love it. It's a taste from their childhood that's hard to find these days (at least outside of CSA boxes around the country). Well never fear...I have lots of kohlrabi...and with endless possibilities of how to prepare this veggie you are sure to find a way that you can love it. So I thought I should give kohlrabi + tacos a try. The result was A+.....I mean really truly good. Make your tacos according the kit box instructions. Peel and grate kohlrabi bulb. Mix with sour cream, vinegar, salt and pepper. Assemble tacos in shell and top with kohlrabi mixture. Enjoy!